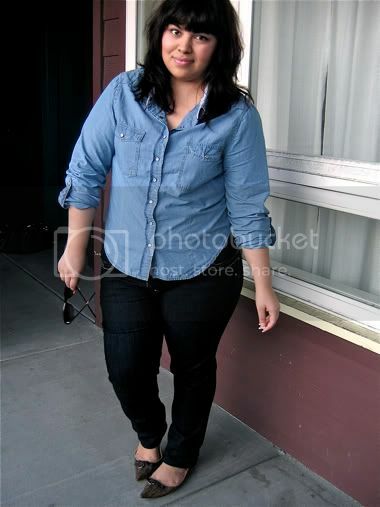 The denim shirt is one of those versatile wardrobe staples you can wear in many ways, as shown by my blog friends. It's a year round shirt in my opinion, you can transit from season to season with just a few changes and accessories. 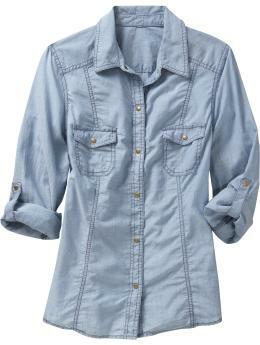 I've had my eye on a denim shirt for a while, so its definitely going to be in my closet this spring. Trends & Friends is a new feature I am trying out on my blog. I wanted to showcase trends as well as real people wearing them. I hope you like it, I value your comments and feed back. Thanks to J, Valerie and Stephanie for allowing me to use their pictures. I will be on the look out for more trends, so if you want to be featured as a "friend" please email me. I will also be contacting you to use some of your pictures. You don't need to have a blog or website to be featured, I just need your pictures. I Was Just Thinking About Purchasing A Demin Shirt While I Was At Torrid The Other Day! Now I Have To Go Back N Get It! lol! I'm not supposed to be buying new clothes for a while but I'm craving a denim shirt so bad! wow what a great idea!!! I love it!!! Not a denim shirt person, but all these ladies look great! i just got a denim shirt from ON ... cant wait to wear it now after these inspirations! thanks girl! Thank you for the feature :) I really like this idea of Trends & Friends it's a good way to check up coming trends whilst seeing what they look like on! Thanks Ladies! I am glad you all liked the feature. My point was to show how us real woman are wearing the trends. They look fab on the websites and models. It's way more fun to see all the trends on real woman. I love how we all have different styles and make the same trend look fabulous! I love the denim trend. :) and you all look great in your outfits.